And the Social Science … a dreary, desolate, and indeed quite abject and distressing one; what we might call, by way of eminence, the dismal science. 'Occasional Discourse', Fraser's Magazine (Dec 1849). Reprinted as a separate pamphlet (1853), reproduced in The Collected Works of Thomas Carlyle (1864), Vol. 13, 5. As for France and England, with all their pre-eminence in science, the one is a den of robbers, and the other of pirates. If science produces no better fruits than tyranny, murder, rapine, and destitution of national morality, I would rather wish our country to be ignorant, honest, and estimable as our neighboring savages are. Letter (21 Jan 1812) to John Adams. Collected in Thomas Jefferson Randolph (ed. ), Memoirs, Correspondence and Private Papers (1829), Vol. 4, 173. I have often thought that an interesting essay might be written on the influence of race on the selection of mathematical methods. methods. The Semitic races had a special genius for arithmetic and algebra, but as far as I know have never produced a single geometrician of any eminence. The Greeks on the other hand adopted a geometrical procedure wherever it was possible, and they even treated arithmetic as a branch of geometry by means of the device of representing numbers by lines. In less than eight years “The Origin of Species” has produced conviction in the minds of a majority of the most eminent living men of science. New facts, new problems, new difficulties as they arise are accepted, solved, or removed by this theory; and its principles are illustrated by the progress and conclusions of every well established branch of human knowledge. It is a profoundly erroneous truism, repeated by all copy-books and eminent people when they are making speeches, that we should cultivate habit of thinking of what we are doing. The precise opposite is the case. Civilization advances by extending the number of important operations which we can perform without thinking about them. 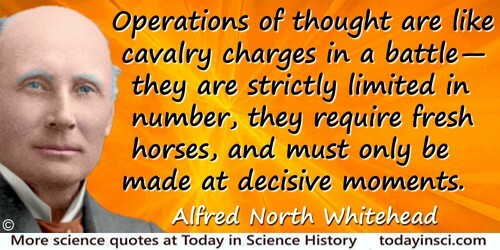 Operations of thought are like cavalry charges in a battle—they are strictly limited in number, they require fresh horses, and must only be made at decisive moments. 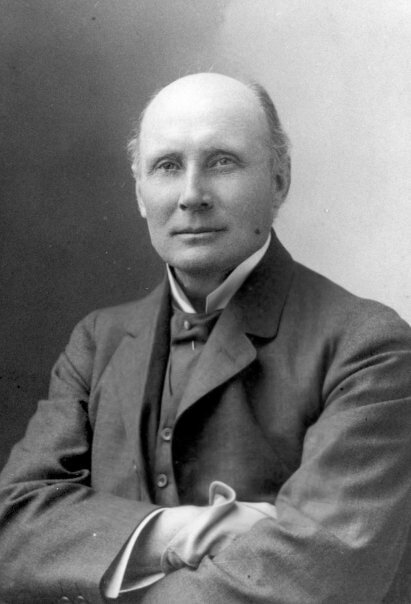 In An Introduction to Mathematics (1911), 61. Plenty of mathematicians, Hardy knew, could follow a step-by-step discursus unflaggingly—yet counted for nothing beside Ramanujan. Years later, he would contrive an informal scale of natural mathematical ability on which he assigned himself a 25 and Littlewood a 30. To David Hilbert, the most eminent mathematician of the day, he assigned an 80. To Ramanujan he gave 100. In The Man who Knew Infinity: A Life of the Genius Ramanujan (1975), 226. The mere eminence of a specialist makes him the more dangerous. 'The Need For General Knowledge,' Rambler No. 137 (9 Jul 1751). In Samuel Johnson, Donald Greene (ed. ), Samuel Johnson (1984), 223.